Why Does Lemon Juice Keep Potatoes From Turning Brown? What Keeps Shredded Potatoes From Browning During Freezing? 1 How Do I Preserve Sliced Potatoes? 2 Why Does Lemon Juice Keep Potatoes From Turning Brown? 3 How Long Will Peeled Potatoes Stay Good? 4 What Keeps Shredded Potatoes From Browning During Freezing? Whether you're a professional in a busy restaurant or a home cook struggling to find enough hours in your day, getting meals to the table on time can be a challenge. Often, the only way to do it is by preparing as many things ahead of time as possible. For example, it's easier to prepare a large pot of potatoes if they're peeled a day ahead. However, it's important to take steps to keep them from discoloring once they're peeled. Storing your potatoes in water after peeling will keep them from browning, allowing you to peel them the day before. Potatoes are thought of as a bland food, but their flavors are surprisingly complex. New potatoes are low in starch and have a sweet, fresh taste, while long-storage potatoes benefit from deeper flavors caused by natural enzymes in their flesh. Those flavor compounds generate a broad range of aromatic notes, from earthy and fatty to floral and even fruity. That's one of the reasons why potatoes are such a satisfying and palate-pleasing food, even when they're cooked and served in relatively simple ways. Unfortunately, if you peel them in advance, many of those same characteristics will work against you. When you peel your potatoes, your blade cuts through their cell walls and allows the outside oxygen to interact with the potatoes' juices. The enzymes and phenolic flavor compounds that make potatoes taste good react with that oxygen to produce a film of soft, dark-colored cells at the potatoes' surface. These are a chemical defense, designed to attack the tissues of an invading worm or insect, and they're inconvenient for human cooks as well. Fortunately, several factors can slow the process. Since the browning reaction depends on oxygen to work, shielding your cut potatoes from the air is an important first step. The best way to do that is by immersing them in water. Cold water is best, because the browning process works more quickly at warm temperatures and slows in cooler surroundings. Cold water also helps keep the potatoes' starchy cell walls firm and rigid, for better texture. Finally, acidity helps prevent the browning effect. That's why cut fruit is often dipped in lemon juice, before it's added to fruit salads. To prepare your potatoes ahead of time, then, have a bucket or other storage container ready when you begin peeling. Rinse any residual dirt from each potato as it's peeled, and drop it into your bucket of cold water. Whole potatoes are best, because they expose less of their surface area. Once you've finished peeling, add a small amount of lemon juice, white vinegar or cream of tartar to the water. 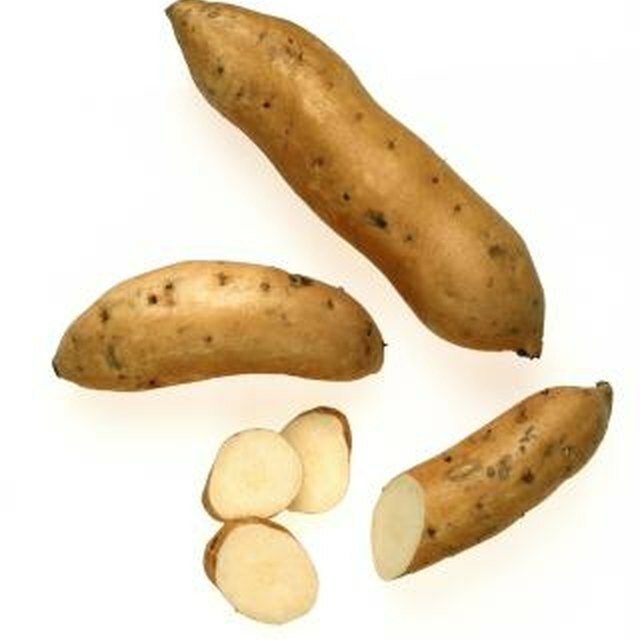 Cover the potatoes with a plate to ensure they stay submerged, and store the container overnight in your refrigerator. The next day, your potatoes should be pale, firm and ready to cook.